Jacki was one of my first LaManchas & she is definitely the all-time favorite! If I could have a whole herd of Jackis - I would. & we’re working on it, since she is so generous with her daughters & we've retained several! Jacki is one of those “complete package” does that you can’t help but love & appreciate. She has been slow to mature, but finally started to blossom as a 3 year old. She shows well, appraises well & is the most productive all the way around, kidding with multiples all but once for us, so far. She is also our best milker with the longest lactation. Jacki's dam, Buffy had purportedly been milking for 2 years at time of purchase. Wow! 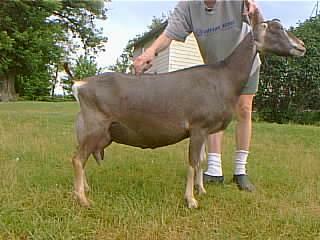 Jacki’s 2003 Dash daughter, Jigsaw is also taking her time maturing but is a lovely & correct doe with a very pretty & productive mammary. Jigsaw appraised well as a first freshening 2 year old . . . & can boast the 2nd-highest rear udder height in the herd with an impressive 46! Jacki’s 2004 Jrufio daughters, Jetty & Juji are night & day to each other with Jetty being the ugly kid & Juji doing a fine job, strutting her stuff in the Intermediate class . . . & then switching places as dry yearlings with Jetty going through a growth spurt, so strutting her stuff doing well in the dry yearling class while Juji stayed home being the ugly & gangly one. We’ll see what happens with these two as first freshening 2 year olds, LOL! Jacki’s 2005 Matrix daughters, Jada & Jonquil are typical chamoisee Matrix kids. Since Matrix was so generous with his 2005 daughters, Jada went to a show herd in Indiana (thanks, Engels!) & Jonquil somehow snuck out of here to go hang out with good friend Karen Kimberly (Country Charm Nubians . . . & a sprinkle of LaManchas). These pictures don't do Jacki much justice, as I never seem to have the camera - or a photographer - handy when she's full/clipped. As indicated by her 2004 appraisal, Jacki excels in body & mammary. She has a lovely, globular, well-attached mammary with a good medial & nicely-placed, easy-to-milk teats. Combine these qualities with udder texture like silk & Jacki's sweet personality (which she passes along to her offspring) & this just makes make her an absolute dream to have around! Jacki showed well in 2003, standing at or near the top of her age classes, 1xRGCH & 1xGCH for her first milking leg toward her Permanent Championship at the last show of the season in 2003.